I really, REALLY hate to tell you this, but summer is half way over, and you know what that means? Back to school shopping is just around the corner! Get ahead of the game by purchasing your backpacks now, before all the good ones are taken. 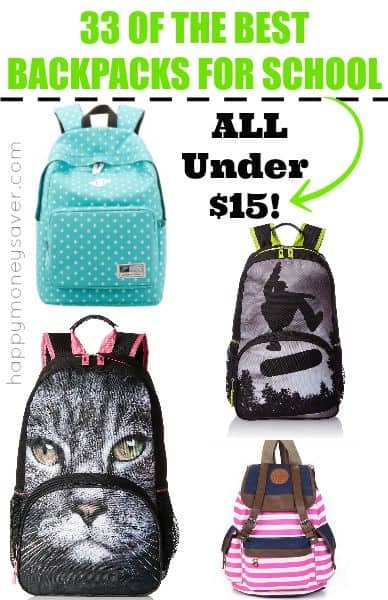 I have found you The Best Backpacks For School all under $15, including shipping costs! Thats cheaper than walmart people! Many of these backpacks are on sale right now, and if you know Amazon, you know that prices can and often do change quickly, so don’t delay! I have found some adorable backpacks for pre-k all the way up to high school aged kids. I hope you find something you or your child will like. Happy shopping! 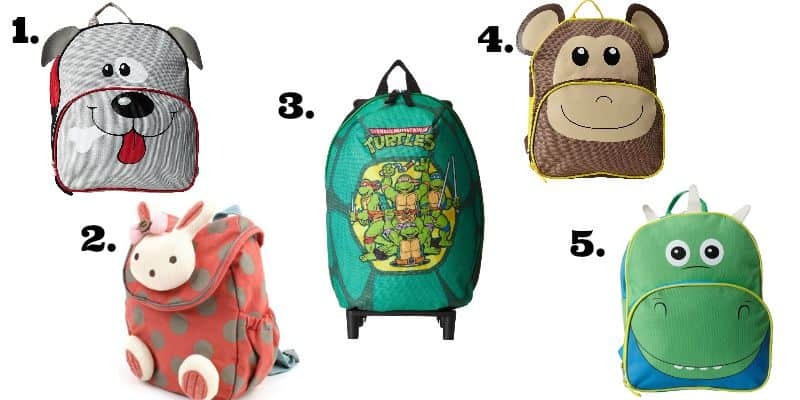 These backpacks are perfect for preschool-1st grade. They are smaller packs and just plain adorable! 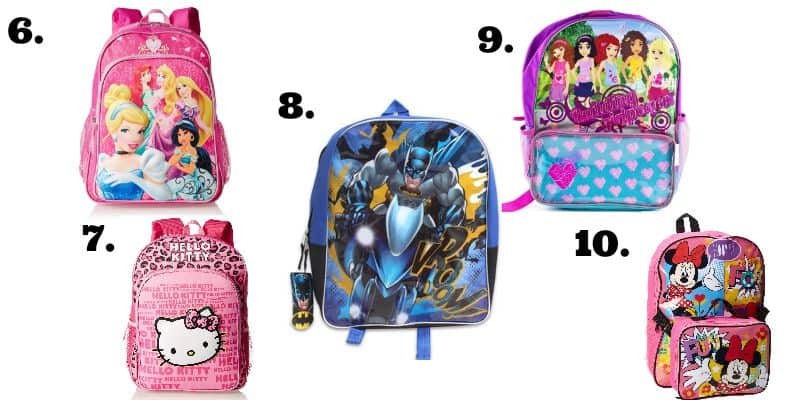 Does your child love Character backpacks? I got you covered! Do you have a trendsetter on your hands? 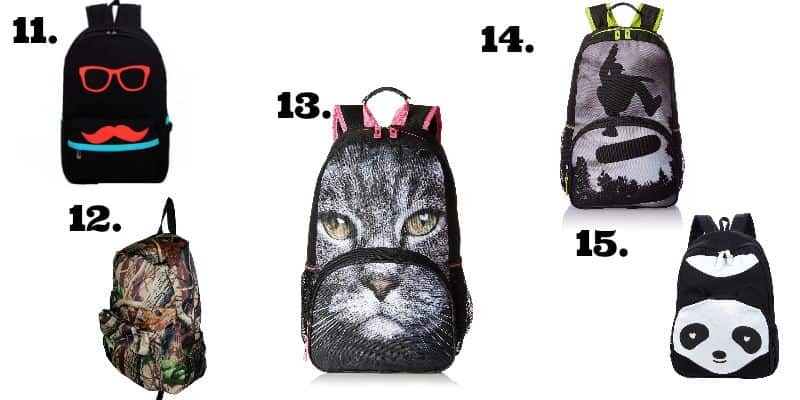 The cat backpack is so creepy, but it is so popular right now! Maybe one of these packs will be the perfect fit for your child! 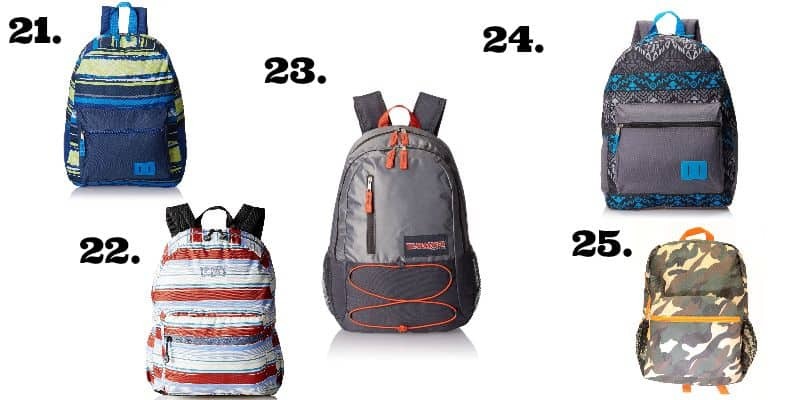 You can’t go wrong with any of these backpacks. What boy doesn’t like skulls or baseball? And the girls? With backpacks covered in hearts, flowers, and paint splatters, you are sure to find something here they love! 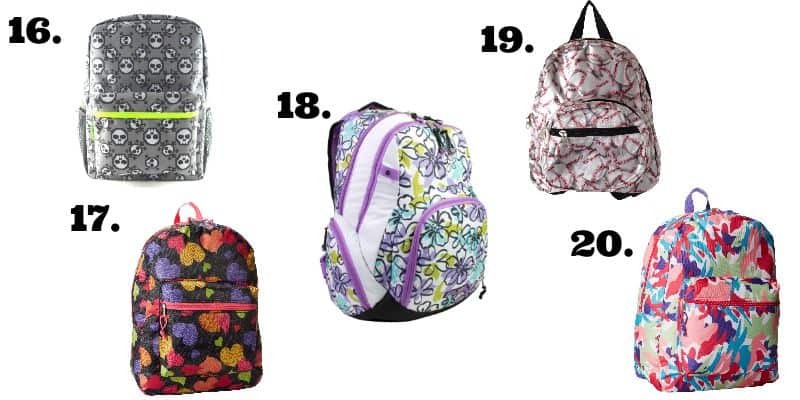 These are some of my favorite boy backpacks! I am in love with these cute girl backpacks. We got glitter, chevron and polkadot packs- my favorite! Here are some of my last minute finds. I absolutely love that shark backpack, so cute! 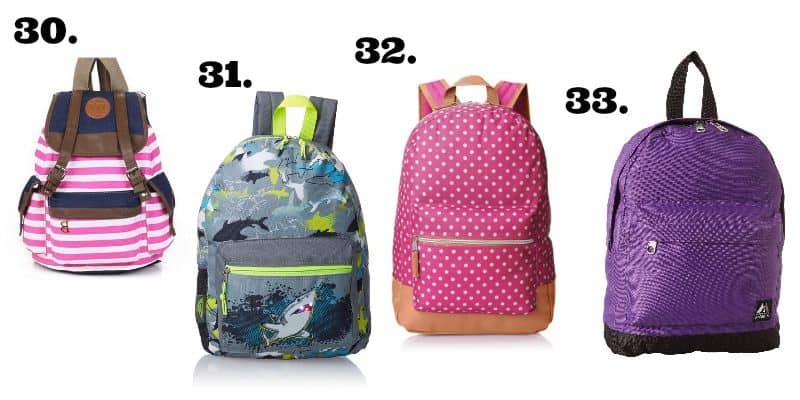 And if you have a fashionista on your hands they will love backpack #30. 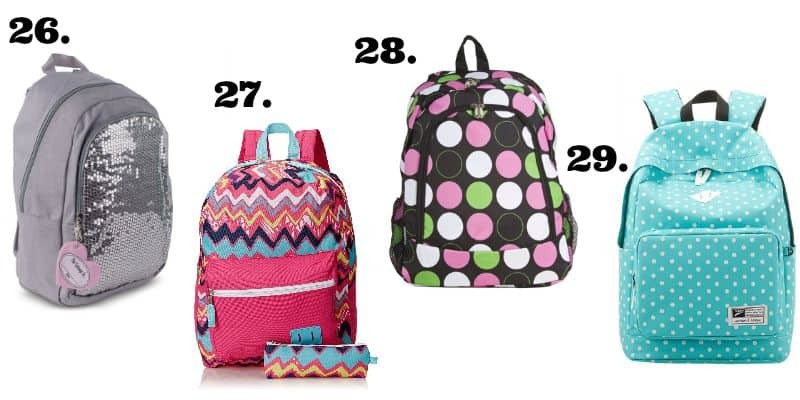 Backpack 33 comes in tons of colors, and 32 is just adorable! Were you able to find a backpack for your school aged kid? There is no reason to pay over $35 dollars for a backpack, when there are so many thrifty options available! 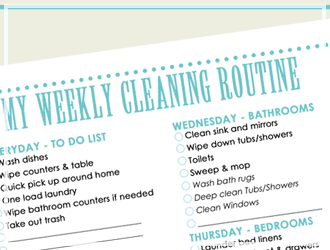 Good luck and happy back to school shopping! Hi would you mind letting me know which hosting company you’re using? I’ve loaded your blog in 3 completely different web browsers and I must say this blog loads a lot faster then most. I use Bigscoots, they are amazing! Don’t dismiss the idea of purchasing a more expensive, high quality backpack! LL Bean has their Deluxe Book Packs on sale right now for under $30 with free shipping. My daughter used her last one for 4 years (junior high and high school) and my son is going on his 3rd year on his. Plus they really stand behind their products. My daughter had a cheaper pack in elementary school and it barely made it through the year and had to be replaced the next fall. Consider the quality of the pack – the more expensive one might just be the better deal in the long run. Perfectly said! We LOVE LL bean backpacks, it is all I will buy. I grew up having them and now my daughters have them.